Police in South Florida shot an unarmed black caretaker Monday as he tried to help his autistic patient. Charles Kinsey was trying to retrieve a young autistic man who had wandered away from an assisted living facility and was blocking traffic when Kinsey was shot by a North Miami police officer. The North Miami Police Department said that they were responding to a call about an armed man threatening suicide, but they have released few other details about the shooting itself. In cellphone footage of the incident that emerged Wednesday, Kinsey can be seen lying on the ground with his hands in the air, trying to calm the autistic man and defuse the situation seconds before he is shot. “All he has is a toy truck in his hand,” Kinsey can be heard saying in the video as police officers with assault rifles hide behind telephone poles approximately 30 feet away. Seconds later, off camera, one of the officers fired his weapon three times. A bullet tore through Kinsey’s right leg. Kinsey said he was stunned by the shooting. “I was thinking as long as I have my hands up … they’re not going to shoot me,” he told local television station WSVN from his hospital bed. “There is no reason to fire your weapon at a man who has his hands up and is trying to help,” Hilton Napoleon told The Washington Post in a telephone interview Wednesday night. Napoleon called for the department to fire the officer. North Miami is a city of about 62,000 people that sits on Biscayne Bay, tucked between the much larger cities of Miami and Fort Lauderdale. Gary Eugene, the city’s police chief, was appointed to the position just a month before the shooting. He had joined the department in 2013 following his retirement from the Miami police force, where he spent nearly three decades. Eugene said he had asked the Florida Department of Law Enforcement (FDLE) to investigate the shooting, and a spokeswoman for that agency confirmed Thursday morning that it had launched an investigation. “Bringing in an outside agency shows our commitment to transparency and objectivity in a very sensitive matter,” Eugene said. Eugene and the North Miami police did not release the name of the officer involved, referring questions instead to the state agency, which said it would not name the officer. The police department has released relatively few details about the shooting, which drew widespread attention days after it occurred when video of the episode began to spread online. During his briefing Thursday, Eugene said that police received a 911 call Monday just after 5 p.m. about “a male with a gun threatening to commit suicide.” There were witnesses that also reported a gun, Eugene said. Police have not responded respond to multiple requests for comment. According to their statement, the officer involved has been placed on administrative leave, as is standard policy in police-involved shootings. Authorities have not said why the officer opened fire on an unarmed man with his hands prominently in the air and with another man nearby. Attorney General Loretta E. Lynch said the Justice Department was aware of the North Miami shooting, but she said federal officials do not know enough yet to know if they will review it. This latest shooting comes at a tense time for police and civilians, after a remarkably fraught period that saw high-profile shootings of and by police officers. Police across the country are on alert after gunmen ambushed officers in Dallas and Baton Rouge just days apart, killing eight officers. At the same time, police are under scrutiny after the fatal shootings of two black men earlier this month. Bystanders filmed Baton Rouge police fatally shooting Alton Sterling in the early hours of July 5. Less than 48 hours later, Philando Castile was fatally shot by an officer in Falcon Heights, Minn. His girlfriend streamed the aftermath on Facebook Live. Like those two incidents, the Monday afternoon altercation was partially captured on camera. “He was lying on the ground, with his hands up, freezing, being rational, and he was still shot,” Rep. Frederica S. Wilson, D-Fla., who represents part of Miami-Dade County, said at the news conference Thursday. The autistic man sat on the ground, blocking traffic, while he played with a small white toy truck, Napoleon told The Post. Kinsey, an employee at the facility, went to retrieve him. Around the same time, someone in the area called 911 and reported seeing a man with a gun threatening to commit suicide, police said. According to Napoleon, Kinsey was trying to persuade the autistic man to get out of the street when police approached with their rifles raised. 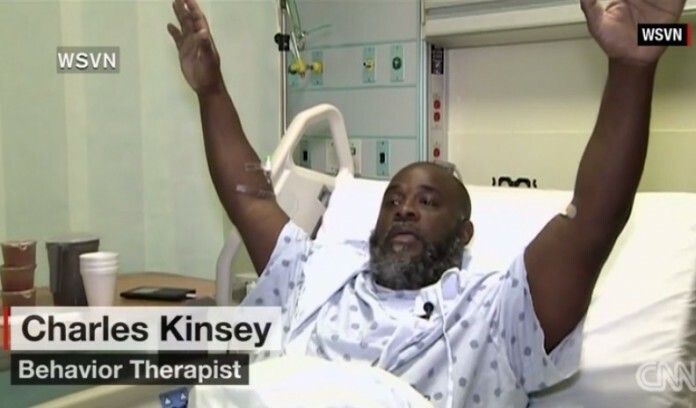 With the Sterling and Castile shootings on his mind, Kinsey lay down on the ground and put his hands in the air. “I was really more worried about him than myself,” Kinsey told WSVN, referring to the autistic man. Two bystander videos capture snippets of what happened next. A video from before the shooting – obtained by Napoleon and shared with The Post – begins with bystanders saying “Look, look, look,” in Spanish. “Mira, mira, mira,” a man can be heard saying, training his cellphone camera on Kinsey, who is on the ground with his hands up and trying to get the autistic man to do the same. “Lay down on your stomach,” Kinsey tells the young man. Kinsey turns his attention to the police. As police aim their assault rifles at the men in the street, Kinsey tries to explain to them that they pose no threat. “All he has is a toy truck in his hand. A toy truck,” Kinsey can be heard saying in the video. “I am a behavioral therapist at a group home. The autistic man then begins to make noises, apparently playing with his toy. The video then cuts out, leaving a critical gap in the footage. One of the bullets struck Kinsey near his right knee, exiting his upper thigh. “My life flashed in front of me,” he told WSVN, adding that his first thought was of his family. His second thought was one of confusion. “Sir, why did you shoot me?” Kinsey recalled asking the officer. A second video captures the moments after the shooting, as officers placed the injured Kinsey and the autistic man into handcuffs. “Because the things with the blacks,” another man says. “I don’t know who’s guilty,” adds what sounds like a woman’s voice. It was the officers’ reaction after the shooting that upset Kinsey and Napoleon the most. “Right now, I am just grateful that he is alive, and he is able to tell his story,” his wife, Joyce, told the TV station. Kinsey was “dumbfounded” by the shooting, Napoleon said. Napoleon said his client was on the ground with his hands up, as in the video, when shot. Napoleon said he knew better than most the dangers cops endure on a daily basis. “You’re talking to someone whose dad was a police officer in the city of Detroit in the ’70s and ’80s,” he said. “I understand it. 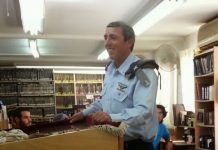 I had a fear when I was a child of whether or not my father was going to come home. Napoleon said he was already in negotiations with the city of North Miami regarding a possible settlement. The attorney said he trusted the state’s attorney’s office to determine whether criminal charges should be filed against the officer. Napoleon said Kinsey, a father of five, is involved in community efforts to keep youths out of trouble and in school.